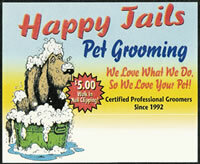 Would Your Pet Enjoy “Jail”? If you’re going to run advertising online or offline always get someone else to double check your work. There are numerous times when a designer or a company interprets their work one way and the public interprets something completely different. This mentality has lead to more than a few failed advertising campaigns over the years. Always test your advertising with the public before going public. A few people can quickly identify something that isn’t obvious to you or your company. Use their feedback to make any necessary corrections. When it comes to advertising and marketing, get out of your ego and into the customer’s ego.